Indian Truth, a periodical published monthly from 1924 to 1986, promised, in its editor’s words, “a brief comprehensive review of Indian happenings”—from social news to legal proceedings and summaries of educational programs. 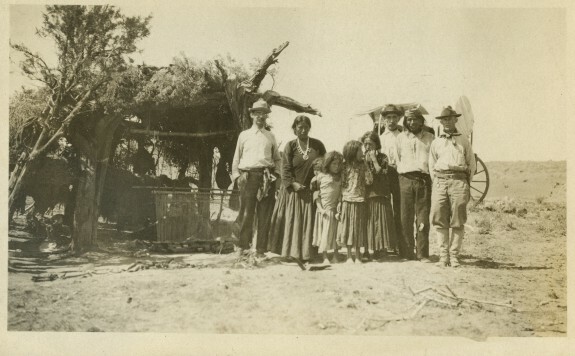 This photo, from the early twentieth century, is of a group of Navajo and Indian Rights Association (IRA) members. While advocating for fair treatment of Native Americans, IRA members took trips to reservations in order to monitor the actions of the Indian Bureau, which was known to treat Natives harshly. Specifically, children were placed in segregated boarding schools to speed assimilation and were sometimes beaten for using their indigenous language or praying to their own Supreme Being. Born in Philadelphia in 1851, Herbert Welsh began his life as an artist and ended it as an activist. 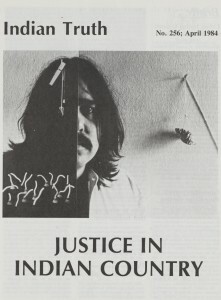 Educated at the University of Pennsylvania and the Philadelphia Academy of Fine Art, Welsh’s trajectory changed following a visit to a Sioux reservation and he began to advocate for Native American rights. 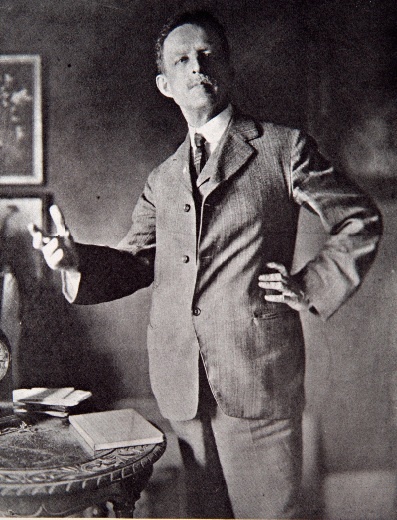 Welsh was a founding member of the Indian Rights Association, as well as president of the Civil Service Reform Association of Pennsylvania. Welsh dedicated himself to many causes, including civil service reform, government reform, and nature conservation. The Women’s National Indian Association and the Indian Rights Association, both founded in Philadelphia in the late nineteenth century, led the way in setting a national agenda concerning the plight of Native Americans. They continued a local tradition of reform movements promoting rights and freedom. Founded in 1879, the Women’s National Indian Association organized by Mary Lucinda Bonney and Amelia Stone Quinton of the Home Mission Circle of the First Baptist Church of Philadelphia became nationally prominent. During the association’s first three years, it merged and renamed itself often as it collaborated with other Protestant groups in the Northeast and Midwest who shared its missionary zeal and desire to ensure that Indians had their political rights on reservations protected. While the women’s group focused primarily on religious matters, on December 15, 1882, thirty or forty wealthy reform-minded gentlemen gathered at the Philadelphia home of the Honorable John Welsh to hear from the judge’s sons, Herbert (1851-1941), and Henry S. Pancoast (1875-1939). They had just returned from a visit to the Dakota Territory as guests of Episcopal missionary Bishop William Hobart Hare (1838-1909). Concerned about the living conditions of the Sioux and U.S. Indian Bureau corruption, the men created the Indian Rights Association (IRA). Over the next 100 years, the IRA worked “to secure to the Indians of the United States the political and civil rights already guaranteed to them by treaty and statutes of the United States.” Members concentrated on education, enforcement of state and territory law on reservations, and the establishment of a system of individual land ownership on reservations. IRA members believed assimilation and Americanization within a Protestant context were the way for Indians to survive in the fast-growing United States. The IRA’s strength and longevity came largely from a strategy focused on popular opinion and federal legislation. Within two years of its founding, the IRA established a second office in Washington, D.C., and within three years had chapters nationally. Use of the press and lobbyists allowed the IRA leadership to affect federal appointments and introduce bills such as the Citizenship Act of 1924, which granted U.S. citizenship to all Indians. The IRA investigated tribal complaints about federal agencies, filed amicus briefs on Indian issues, and supported tribes in property conflicts and tribal recognition. Its Indian Truth, published from 1924 to 1986, promised, in its editor’s words, “a brief comprehensive review of Indian happenings”— from social news to legal proceedings and summaries of educational programs. Due to this publication and an active speaker circuit, the IRA became one of the primary sources of information and documentation of life on Indian reservations. 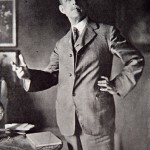 By the mid-1900s, IRA’s mission changed from educating Indians in the ways of the “white” world to educating mainstream Americans about native cultures. In 1971, the board of directors officially recognized a shift in its mission with new policies. By the time of its centennial in 1982, the IRA found it necessary to reconsider not only its mission but its purpose for being. Indian-run organizations were performing many of the functions that it had. 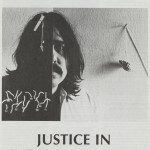 Unable to develop a unique niche and find funding, the IRA closed its doors in 1994. Blend, Benay. 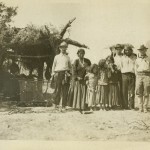 “The Indian Rights Association, the Allotment Policy, and the Five Civilized Tribes, 1923-1936.” American Indian Quarterly VII (Spring, 1983): 67-80. Cadwalader, Sandra L. and Vine Deloria. The Aggressions of Civilization: Federal Indian Policy Since the 1880s. Philadelphia: Temple University Press, 1984. Hagan, William. T. “Civil Service Commission Theodore Roosevelt and the Indian Rights Association.” Pacific Historical Review 44 (May 1975), 187-200. Hagan, William T. The Indian Rights Association: The Herbert Welsh Years 1882-1904. Tucson: The University of Arizona Press, 1985. Hoopes, Alban W. “Preliminary Report upon the Correspondence of the Indian Rights Association in the Welsh Collection.” The Pennsylvania Magazine of History and Biography 67 (October 1943): 382-89. Indian Rights Association. The Indian Rights Association. Philadelphia: Indian Rights Association, 1923. Mathes, Valerie Sherer. “Nineteenth Century Women and Reform: The Women’s National Indian Association.” American Indian Quarterly 14:1 (Winter 1990): 1-18. Welsh, Herbert, and Indian Rights Association. Report of a Visit to the Great Sioux Reserve, Dakota: Made During the Months of May and June, 1883: In Behalf of the Indian Rights Associations. Philadelphia: Executive Committee, 1883. Indian Rights Association. Records, 1830-1986 (Collection 1523), Historical Society of Pennsylvania, Philadelphia. Indian Rights Association Pamphlets, Years: 1884-1985. Center of Southwest Studies, Fort Lewis College. Durango, Colo.
Former home of John Welsh: 1034 Spruce Street, Philadelphia. Former IRA Philadelphia office sites: In 1884, 1316 Filbert Street, Philadelphia; from 1924-31, 995 Drexel Building, 301 S. Seventeenth Street, Philadelphia; from 1967-82, 505 Race Street, Philadelphia.